The awesome potential of the Internet to help small businesses widen their market and increase sales is being tested by local architectural designer John Gower. The 41-year-old has launched a website to sell his home plans and ultimately promote Nelson as a hub of self-employed professionals using electronic commerce to tide them over during traditionally lean winter months. “I think everybody self-employed in Nelson complains about the same thing, January and February are quiet times, its pretty cyclical and you don’t have any fall-back to tide you over,” Gower said. But so far this month his website, www.bcmountainhomes.com has had almost 300 visits. Gower was born and raised in Vernon, B.C., and arrived in Nelson in 1981. He left to study architectural design at Carleton University in Ottawa then did a masters degree in geography at the University of British Columbia. He returned to Nelson in 1989. “When I came back I thought I would be doing geography related work, but I also had quite a few years of architectural experience. My first job here after I returned was a three-month contract to produce an economic development strategy for the Slocan Valley,” Gower said. In 1990 he met fellow Nelson-based designer David Dobie. “Early in 1990 I had a prospective design client up the valley and went to David’s office for some blue prints,” Gower said.”I had admired his work for a long time and he liked what I was doing so we started collaborating.” The pair were inspired by the rich variety of architectural styles in Nelson. “It just got busier and busier and the practice grew year after year. Between us some years we did as many as 70 projects. About 80 per cent of the work was on houses, new and renovations,” he said. The business relationship ended in 1998 when Gower went to Mexico for four months, though the pair still work together on some projects. 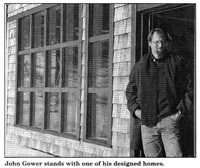 Gower’s dream of using the Internet to sell copyrighted home designs began in 1996 after a visit from local Internet service provider, The Net Idea. “I had been thinking of doing a catalogue of house plans, and selling those in book form,” he said. “I thought, there’s lots of opportunity here to market primarily small house designs for challenging lots, the sort of thing you come up against in this area and for which there wasn’t a lot of product out there. Gower learned how to program a computer and design a web page and 1500 hours later produced the site. He has 12 house plans on the website, for sale at between $230 to $850, depending on square footage, plus photos of Gower-designed homes, business information, a plan book and links to similar sites. The home page has a photo of Nelson in summer and, naturally, an order form. Gower said the next challenge for small business Internet users was finding a cheap option to take credit card payments. The B.C. Mountain Homes site presently takes payment only by cheque or money-order. He hopes Nelson businesses using e-commerce might be able to join together and somehow reduce the cost of taking credit card payments. Consumer shopping online was worth $28.5 billion[sic] in Canada in 1998. “Hopefully I can sell a plan many times over to recoup costs. You don’t make them so expensive that it’s cheaper for someone to steal your idea and have a draftsperson draw it up,” Gower said. He believes B.C. Mountain Homes’ Internet push will promote smaller, more-detailed homes with focus on natural lighting and energy-efficiency. “I’m promoting a product that I think is really timely, I like the idea of building smaller, more interesting and functional houses, it’s the way of the future,” Gower said. “I think the standard house product out there is pretty big and uses a great deal of energy, it’s hard to clean, hard to furnish. As a whole you have to get away from that, which more and more people are realizing. Gower also uses the website to market his contract design service that ranges from 3 to 7 percent of the cost of the project. “By building smaller, if you do it right, you can still have all the living spaces for the different functions,” he said.